Founded in East Humboldt Park section of West Town neighborhood near Crystal and Washtenaw/California. The Latin Jivers were a club put together by former Latin Disciples (MLDs) in the year 1978. When the Jivers first came out some kids from a local Humboldt Park baseball club called the Latino Stars wanted to join the Jivers and full fledged gang developed from there. The Latin Disciples blessed the Jivers to have territory at California/Washtenaw and Crystal “Dark Crystal” in the East Humboldt Park neighborhood. The founder/first President was “Horse.” The Jivers held onto the same rivalries they had as Latin Disciples as they battled with Latin Kings, Taylor Jousters and Gaylords. In the year 1980 or 1981 the Jivers opened a club house at 1731 W. Pierce Street in the Wicker Park neighborhood which became their headquarters in a basement apartment. The Jivers then took Pierce and Paulina as their new territory. The Jivers found new rivalries with the Spanish Lords and Warlords in the neighborhood and this new Wicker Park section proved they belonged on these streets. 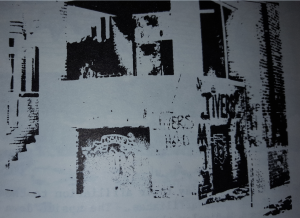 Because the Jivers were born out of the Latin Disciples they were able to become a part of the Folk Nation alliance in 1981 when the doors opened to new gangs, after this they were able to expand greatly in the Wicker Park neighborhood. Throughout the 1980s and into the 1990s the Latin Jivers spread like wild fire and gathered quite a following for a while as they spread further into Wicker Park opening the sets of Division and Greenview, Bosworth and Blackhawk “Brown Jungle,” Cleaver and Potomac (Pulaski Park), Greenview and Potomac “Killa Side.” Expansion continued in the East Humboldt Park area as the Jivers opened up Rockwell and Crystal. The Jivers also pioneered Barry and Linder in the Belmont-Cragin neighborhood. The Jivers also landed in the East Village section of the West Town neighborhood at Erie and Wood and Augusta and Wood. Then by the late 1980s the Latin Jivers made their way into the suburbs of Rockford, Kankakee and Cicero at 24th and 57th. 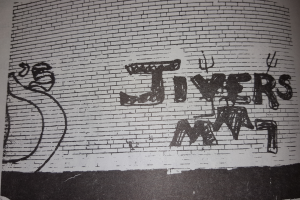 Photo from a 1980s Chicago Police manual back when they used the pitchfork, you can also see the Maniac Latin Disciples tagged on the same wall off to the left but both gangs were strong allies in the 1980s. The Latin Jivers were at the peak of their success by 1990 as Horse was no longer the leader and Louie B took over the new leadership role as they were perhaps at their strongest in numbers. In the year 1991, the Latin Disciples and Spanish Cobras began to have quarrels on the streets which swept allies into the mix and caused the Latin Jivers to sometimes have flare ups with fellow Folks that had beef with Latin Disciples. The Jivers and Disciples had a very strong brotherhood and the Jivers heavily backed the Maniac ways. In the year 1992, the issues between Disciples and Cobras got a little worse and now groups like Imperial Gangsters and Latin Eagles were fighting with other Folks. It became established that the Folks up north needed to separate to create independent identities and to make Insanes and Maniacs more official. The Jivers easily went with the Maniacs and became “Maniac Latin Jivers.” This meant if there were any riffs between Insanes, Almighties and Maniacs the Jivers would have to back up the Maniacs. Over the next three years spats would continue to happen on and off between Maniacs, Almighties and Insanes until 1995 when it all exploded. In the year 1995, the Maniac Latin Disciples began getting greedier over drug turf and began selling drugs in their allies’ neighborhood, this prompted three of their “Maniac” allies to get violent with the MLDs in the summer of 1995. The Latin Jivers were one of those 3 gangs to go to war with the MLDs and it got violent real fast. The Jivers then went to the Spanish Cobras and called for peace and entry into the Insane Familia. The Jivers got in and became the “Insane Latin Jivers.” “Gordo” had taken over leadership of the Jivers at this point and became the long time leader. It only took a year for the Jivers to realize the Cobras were no different, they also wanted all the drug turf, so the Jivers declared war on the Cobras again and broke out of the Insane Familia but kept the “Insane” part of their name. The Spanish Cobras were not happy with them keeping the “Insane” part and it made the war worse, but the Jivers did not care and openly defied the Cobras and their allies the Orquestra Albanies. The only allies the Jivers retained were the Milwaukee Kings that had also gone renegade on the streets and to a lesser extent the Latin Stylers were allies too. The Latin Jivers began to decline in numbers and they lost most of their territory. Cicero was shut down along with all their suburb operations in about the mid 1990s. The Jivers also withdrew from Belmont-Cragin and East Village. In East Humboldt Park the Rockwell and Crystal section closed down. The Jivers also lost some territory in Wicker Park because of gentrification as yuppies and hipsters moved in. 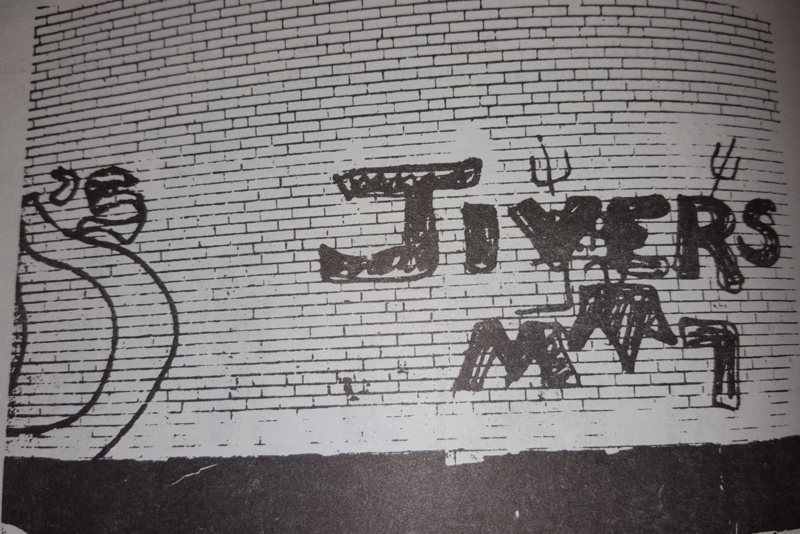 The Jivers continued their existence regardless and continued to be a violent and renegade force on the streets that has always been something to be reckoned with. Please send in 1970s, 1980s, 1990s pics! Who was the founder and what happened to jim? What year did Pierce and Paulina fall? What exactly caused the war between Jivers and Cobras? What year did Cicero open? What year did it close down? What year did East Humboldt Park sets open?